I first heard of bullet journaling in September 2016. 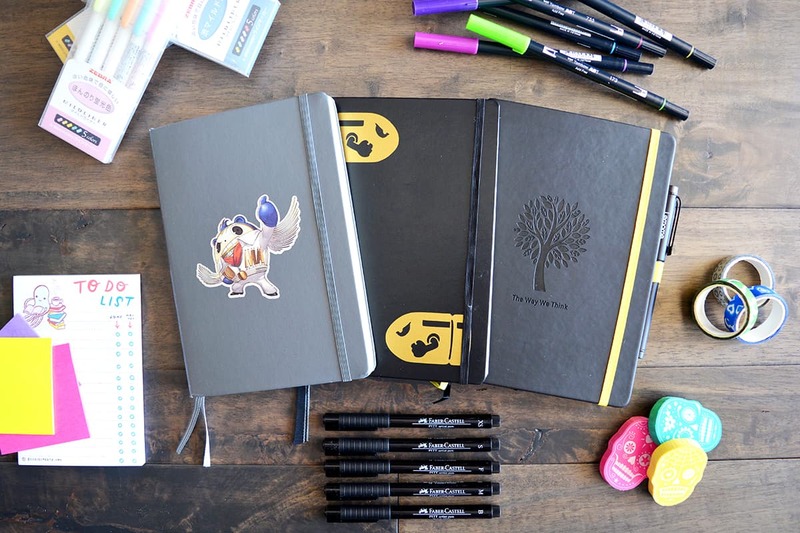 I’d spent years trying multiple (very expensive) planners in an effort to get organized, but nothing was working. Every planner I tried had a problem. Either it was filled with dozens of things I never used, or it lacked some major things I really needed. I tried eight different planners in a period of 16 months, and nothing was working. Then I saw a Pinterest post about bullet journals. I started asking around to see if anyone I knew had tried it, but no one had. Luckily, my dear friend Brittany decided to take one for the team. She started a bullet journal of her own and promised to teach me everything she learned. I started my first bullet journal in January 2017, and I’ve never looked back. This flexible, fully-customizable planning system is the only thing that has ever worked for my manic schedule. However, I wasn’t good at it right away. 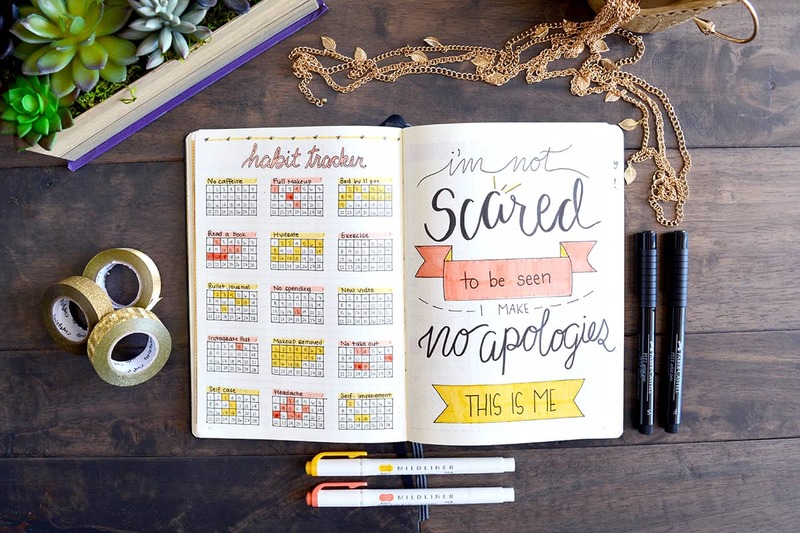 I didn’t come into bullet journaling with any particular set of skills–I’d never done any kind of lettering, I don’t paint or draw, and I hadn’t doodled since childhood. It took a lot of time and experimentation to figure out what I was doing. My early bullet journal pages looked nothing like the beautiful spreads you see on Pinterest and Instagram. My bullet journal wasn’t exactly what I wanted it to be, but I decided to stick with it anyway. I thought there was a good possibility that if I stuck with it, I’d get better as I went. And I did. My first bullet journal was a Leuchtturm 1917 A5 Dotted Notebook. Pictured below is my first ever monthly spread, and as you can see, it’s nothing special. There’s no color, no decoration. It’s just a very simple calendar layout that didn’t even see much use. My early weekly spreads were the same–just simple boxes for writing down events and task lists. They were functional and effective, but not particularly beautiful. In my heart, I wanted to create pages that were beautiful as well as function, but I had no idea where to begin. I spent most of that first year focusing on the fundamentals of planning, and kept telling myself that I’d find time to be creative later on. Of course, things changed over time. I still didn’t feel comfortable adding any of my own artwork to my journal for a long time, but I started using stickers to add pops of color and personality. Even this tiny concession to self-expression made my journal feel more personal. That only increased how much I loved it. The pages and spreads I used also changed over the year as I figured out what worked best for me. 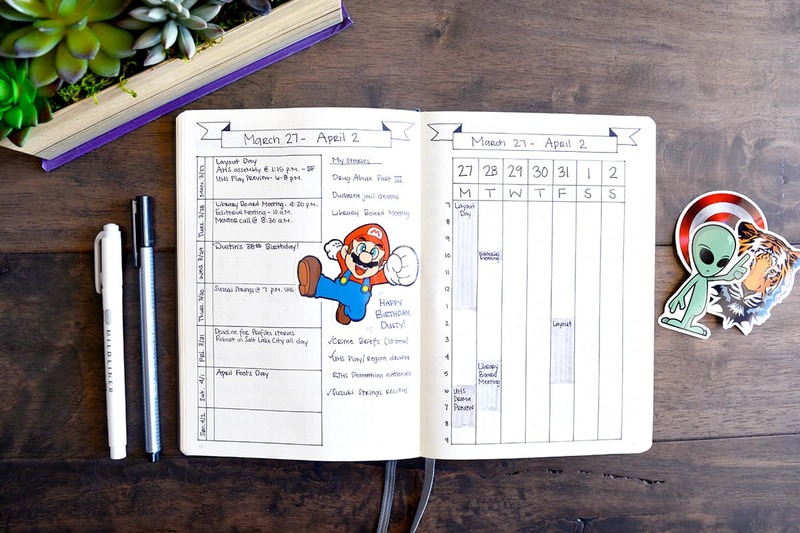 I developed a time tracker spread to give me a visual representation of tasks that were locked into a specific date and time, which is something I still use to this day. I tried and abandoned dozens of daily, weekly, and monthly layouts until I figured out what made the most sense for my lifestyle. Since starting my first bullet journal in 2017, I’ve gotten much braver. My January 2018 calendar layout is essentially the same as the very first calendar I created. However, it’s so much more free-spirited. I followed a YouTube tutorial by AmandaRachLee where I learned to draw snowflakes and icicles. I filled the page with snow-themed doodles, and I added some shiny gold washi tape to liven things up. It worked exactly like that first calendar I ever created, but now it looks like me. Even color eventually made its way into my bullet journal. My entire 2017 journal was done in black, white, and gray. I’m a pretty monochromatic person, so it suited me well, but this year, I just felt that it was time to let some color into my life. I decided to theme all of my February 2018 pages after The Greatest Showman, so my habit tracker for the month was done in red and gold. Alongside it, I paired a bright, colorful quote page. It’s not something I’ve ever done before, but I love the way it turned out. Starting a bullet journal can be intimidating. It’s so tempting to copy what you see everyone else doing. It’s so easy to beat yourself up when your journal doesn’t look as beautiful as the ones on Instagram. But don’t let that get you down. The more you use your bullet journal, the better you’ll get. Your handwriting will improve if you practice. Things like lettering and artwork will get better as you do them more. Your creativity will blossom if you give it a chance. And it’s not just the visuals that will improve–your pages themselves will get better. You’ll get more efficient and figure out exactly what works for you (and what doesn’t). 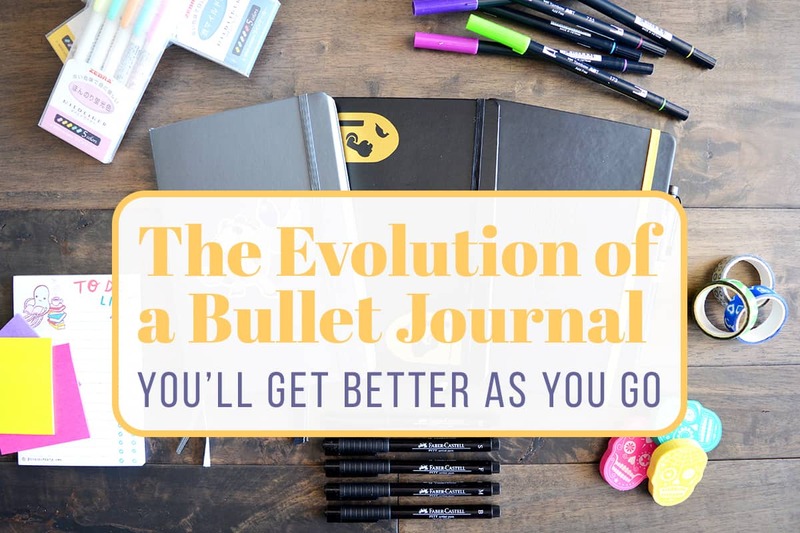 Bullet journals constantly evolve, and they’re never entirely perfect. 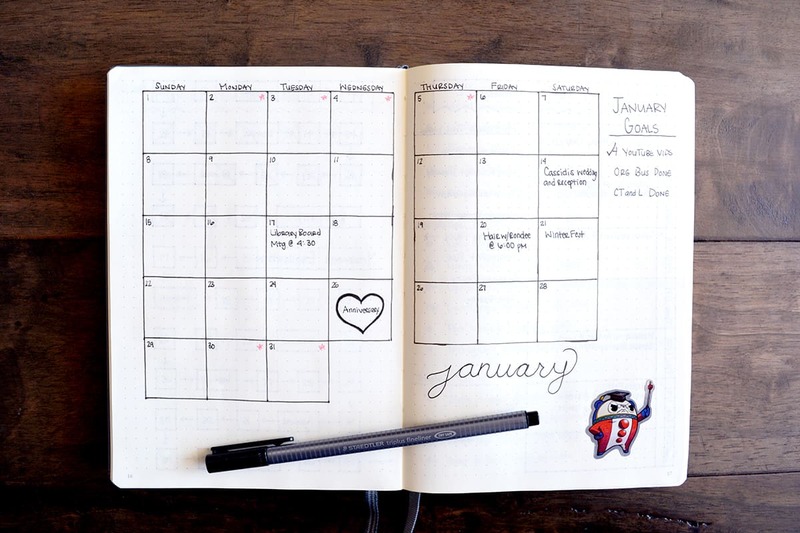 That’s the beauty of a bullet journal–it never stops improving. But I have seen the change with mine too. From minimalistic to super colorful and creative. My BuJo now is a colorful chaos, but in my case chaos is good. It makes me even more creative. It was such an incredible movie Cas! Looking back at all the changes in your journal is so fun and amazing to see. We are so happy to hear this has brought some renewed inspiration and confidence. It’s always reassuring to know you will continue to improve with time. this post was really uplifting. sometimes it’s hard when i see really beautiful spreads and i compare them to my bujo. i’ve been bullet journaling for a year and i think i’ve improved a lot, but it’s definitely harder than i thought!! i’m trying to focus on me, not others. I’m so happy to hear this was helpful for you Katherine! There definitely is improvement as time goes on. Your post is encouraging – I am always getting create ideas from you. I am definitely going to try the monthly habit tracker in the format you showed. I have been looking for ideas on how to track multiple habits in an easy, visible way, thanks so much! It’s great to hear this was helpful and inspiring for you Dianne! Thanks for being here. Where did you get those sugar skull erasers?!? Thank you so much!!! This was the most encouraging post!! I can relax, breathe and enjoy! It’s what I wanted to do, but there is so many incredible journals out there?. I have hope!! Thanks again!! Glad to hear that Helen! Thanks for reading. I think this is such an important topic. I started my first bullet journal in February of this year – I did February on purpose because anything I started in January seemed to just go out the window. In just the last couple months I have seen an evolution. I am a busy mom of two boys and child like husband. I need quick and efficient spreads that I can go back to and “fancy up” when I need a few minutes to de stress. My “perfectionism” has been tested through this process but that’s why bullet journaling as worked for me. If I miss a couple days I don’t feel the need to get down on myself. I don’t need a play by play when I have a sick toddler at home and my 8 year old is nagging me about wanting to play the Xbox. I can only imagine with more time what my evolution will bring. Thanks again! 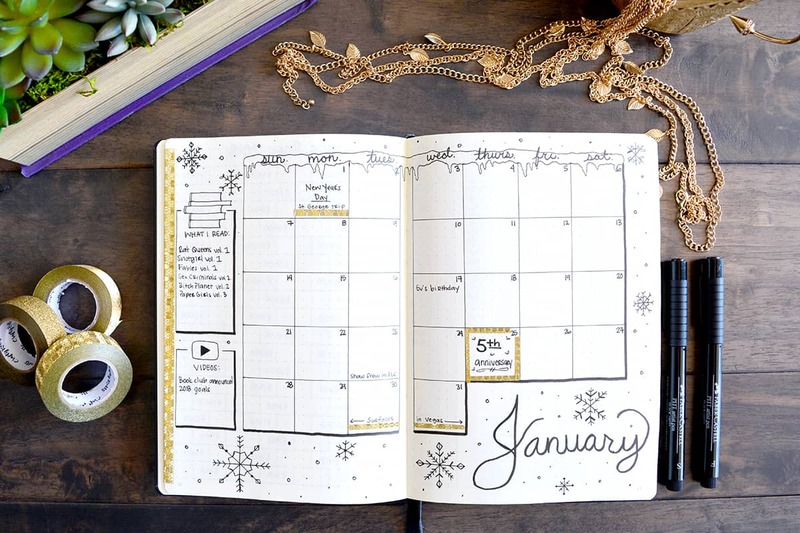 It’s pretty amazing to see how much your bullet journal will change as time goes on, Alyssa!